Once in a while a book captures me and just recently this book by Walter Brueggemann has taken me by storm as I have read and re-read it, made notes, marked it (normally will never mark a book!) and taken in so much of what it says. Ok, it is not the Bible but the timing for me on my spiritual journey makes it poignant. 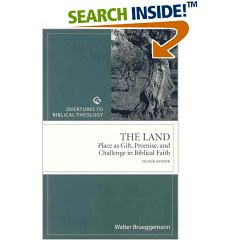 The book explores the life of the people of Israel in regards to its relationship with God and the “promised” Land, exploring biblical themes in times of promise, the land as a gift to the people and then into exile from the land. Brueggemann’s style is very easy to read and he has a clarity in this book which is not always apparent in some authors. It has challenged me on how I live my life in relation to all that God has given to me. Do I hold the gift tightly or loosely? Do I allow the gift to become more important than the giver of the gift? So many questions and challenges. It would be high on my recommend list….and it is well worth the read.